Superfoods are all the latest rage in the health and natural foods industry and with good reason — they are incredibly nutrient dense foods that can help us live healthier, happier and longer lives. Who doesn’t want that? However, there are two downsides to must superfood products on the market today. The first is that they are typically quite expensive. The second is that they often taste ‘interesting’ to put it lightly. Although I love Spirulina and Chlorella, I would never eat them by themselves — normally I them mix into a smoothie or juice in order to make them more palatable. 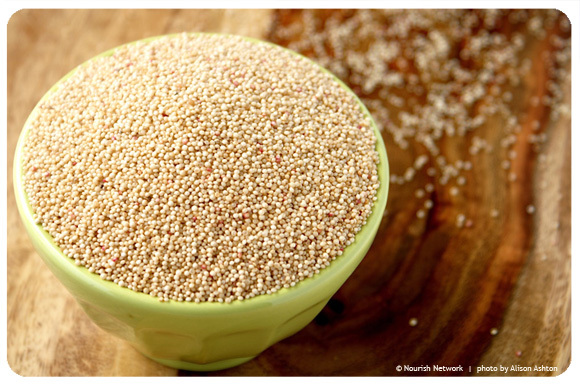 Amaranth is a traditional food used throughout Central and South America, primarily by the Aztecs. When the Spanish conquistadors invaded, they remarked at how strong, agile and healthy the natives were. Eventually they realized they were all consuming large amounts of Amaranth and subsequently banned them from using it. Today, however, the grain is becoming increasingly popular and is finally being recognized for its incredible nutritional profile. You can also find it for a similar price in the bulk bins at your local health food store. Rice bran is the byproduct of the milling process used to make white rice. To make white rice (aka polished rice), the outer layer of the rice grain known as the bran is mechanically separated so that only the endosperm (the inside kernel of rice grain, which is white) is left. The bran is what contains the vast majority of the vitamins, minerals and antioxidants found in rice (this explains why white rice is essentially empty calories). Rice bran is literally just the concentrated vitamins, minerals and antioxidants from brown rice. It tastes great! You could literally eat it straight out of the bag (I do!). You can also usually find it for a similar price in the bulk bins at your local health food store. Yes, pumpkin seeds. Pumpkin seeds are taken for granted as just another tasty seed usually eaten around Halloween but ignored during the rest of the year. Not nearly as popular as sunflower or even hemp seeds for that matter, these delicious, highly nutritious green seeds pack a serious list of essential nutrients. Try them toasted for easier digestion and improved taste. * This is the best price I could find for quality pumpkin seeds online, but you can definitely get them for less than $5 in the bulk bins at your local health food store.